I have never taken part in an Aspiring Bakers Challenge before, but when I saw challenge number 18 on Sweet Sam’s blog I knew that the idea I had been playing around with in my mind, needed to take shape on a plate. I have been thinking about making a layered cake since I watched an episode of Master Chef Australia last year. I don’t usually make layered cakes, as it is only Dave and I at home, and the cake I make is a simple pound cake (thanks Celia for teaching me this) which stays moist all week. It has a simple ganache frosting and we enjoy a slice a night after dinner. April and May are very short months for me, as we spend a week of each month overseas. This leaves little time for challenges as the only time I can bake is over the weekends. I decided that our last weekend at home this month would be dedicated to packing the toiletries we need for our trip, and baking this cake. The recipe I have used is a basic sponge recipe. It worked so well with my time constraints as you can get one layer going while the oven heats, and the next two layers started during the baking process. I used a simple whipped cream filling and topping as I wanted to blend the flavours. My idea was for a multi coloured layered cake, with vanilla on the bottom, coffee in the middle and chocolate on the top. I tied this all together by using nutmeg in the cream. 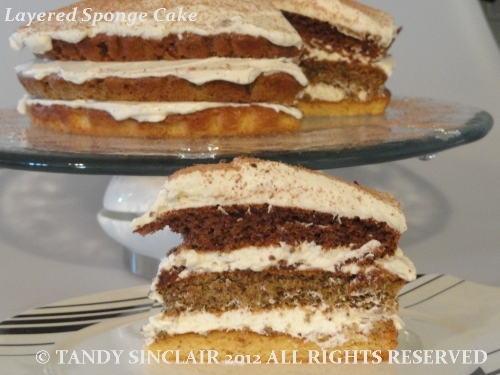 The verdict – I would make this again but if I were making it for friends I would double the ingredients for each layer, to make it really stand out (and stand up). However, I made a small layered cake so that it would be finished before we left for Scotland. My friend Colleen asked me how I got the cream so smooth. I have a lazy Susan in my kitchen and I use it for icing my cakes. The cake plate goes on top of the lazy Susan, and I use my palette knife to smooth the frosting while I slowly rotate the lazy Susan. I keep the palette knife steady and the rotation does the work for me. I am submitting this recipe to Aspiring Bakers #18: Layers of Love (April 2012) which is being hosted this month by Sam of Sweet Samsations. That looks great! I love how that fading works in the layers! I’m not a huge fan of nutmeg but with the addition of honey I bet it is wonderful! Nice job. Cakes Cakes Cakes everywhere! It must be cake season! It looks delicious and simple too! This is gorgeous. Now drink some Scotch! This sounds devine! I love the idea of layering vanilla, coffee, and chocolate cakes together. So simple to make and the frosting sounds like a great way to tie all three layers together. Looks great Tandy – lots of lovely flavours! I baked a caked using Splenda this weekend; a recipe from their website. It looked very promising in the oven, rising and rising, so lovely, and then as it cooled it collapsed into a thin sticky mass. It went straight into the bin. the weather forecast was wrong! We had 2 days of lovely warm weather and then we had SNOW!